During a bushfire, water availability can be the deciding factor as to whether a house survives or burns. Reticulated water supplies cannot be relied upon and CFA resources may be unable to protect all properties. Operation of pumps can supply necessary quantities of fire fighting water but can be intimidating and require complicated set up procedures. The "Quickstrike" pump trolley simplifies pump setting up and operation. The "Quickstrike" pump trolley has been assembled by BlazeControl to provide a portable firefighting pump which is easy to move around and where all required equipment can be stored in the one accessible location and set up ready to use. It comes complete with control valves and recirculation lines to make the unit user friendly during service or maintenance running, training and firefighting use. Ask your BlazeControl representative for a demonstration of the "Quickstrike" pump trolley's user friendliness. 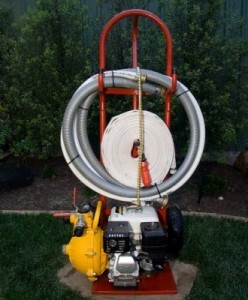 5.5hp Honda/Davey® firefighting pump fitted with 2 ball control valves, (1 for fire hose connection and 1 for recirculation line connection mounted on a modified trolley. 3 metres of 40 mm suction hose with tail ends (add a brass foot valve for pool or dam drafting). Suction and Recirculation hose can also be cut to a required length at additional cost. 18 metre roll of 25 mm PVC layflat fire hose with nozzle and tail end.Additional 18 metre rolls are readily available. 3 metre length of 25 mm dia tank recirculation hose with tail end. Training in pumps use and laminated operating procedures. Keystart "Quickstrike" pump trolley with battery, leads and battery charger. Additional 18 metre roll of 25 mm PVC layflat fire hose with nozzle and tail end. Call (03) 9735 4147 or Mobile 0418 566 166 for a no obligation quote on fixed and mobile "Quickstrike" bushfire sprinkler systems. Blaze Control. Australian suppliers of fixed bushfire sprinkler systems and mobile bushfire sprinkler systems. Installers of full deluge sprinkler systems, mobile bushfire sprinkler systems and bushfire advice.